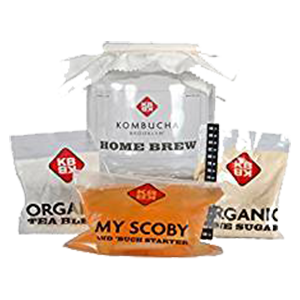 Kombucha (pronounced kom-boo-cha) is a fermented "mushroom tea" that is a nutrient-rich tonic, as well as a refreshing beverage drink. 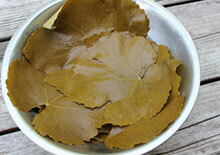 It is cultured from a thick "gelatinous mat" that rests inside a jar of liquid, a blend of tea and sweetener. This mushroom culture is not technically a "mushroom", but a round, firm jelly-like structure, called a "scoby" or "mushroom mother", a membrane of beneficial yeasts and bacteria. As it feeds off of the caffeine and sugar, it creates a cultured sour drink containing B vitamins, enzymes, probiotics and various antioxidants. When it is completely fermented there is some caffeine, about half to one-third of the amount it was made with, but very little sugar content remains in the tea when it is cultured to maturity. 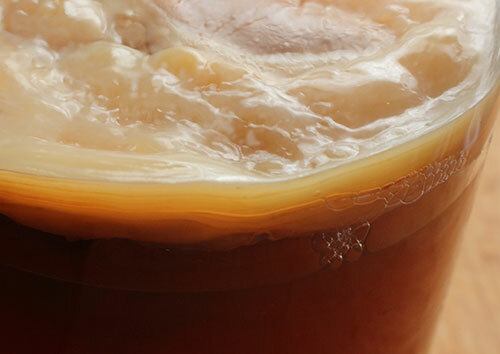 When home-brewing, usually one gallon jars, the scoby floats on the top of the jar where it continues to grow and eventually produces another layer. 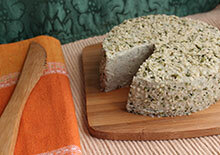 After it doubles in size, it can be peeled apart to create two mushroom cultures. 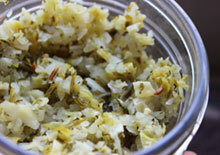 These new layers can be used again to make more gallons of fermented tea. The fermentation process takes between 10 to 14 days and the end result produces a slightly fizzy tangy drink that is best when served chilled. We first began making and drinking kombucha in the early 90's. Back then there were no commercial brands available, homemade versions were the only options. Today, it is widely available and produced on a large scale by many companies. The brand "GT's", was one of the very first mushroom tea products sold in the U.S., retailing more than a million bottles in 2009 and has grown substantially sales since then. The fermented drink is believed to have originated in Manchuria or Northeast China, where the mushroom was referred to as haomo or jiaomu. It became a rather well known health drink in the 1950's and 1960's in China, where it was made homemade-style like other fermented foods. In the early 1900's it made its way to Eastern Russia, called chainyj grib or chainyj kvas, and further spread throughout Europe and Germany. 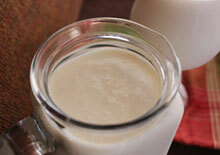 What is the Kombucha Scoby or Mushroom? 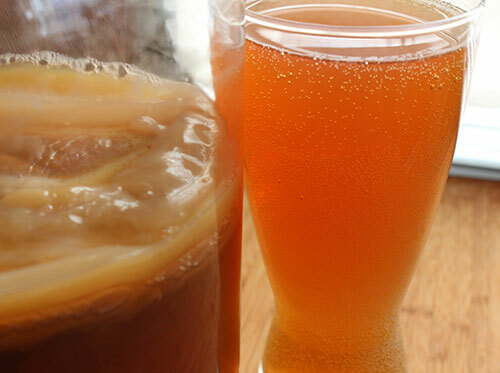 The scoby or mushroom culture is the thick gelatinous mat that forms on the top of the sweetened tea blend made with active liquid culture. 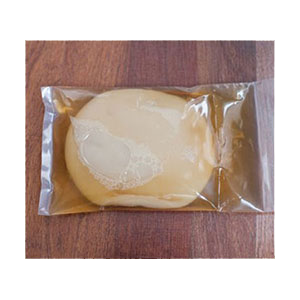 A scoby layer from a previous batch can also be reused or one can be purchased from online suppliers. It is not actually a mushroom species, but is often identified as such because the "fungal" yeast strains are what help to form its rubbery-like structure. 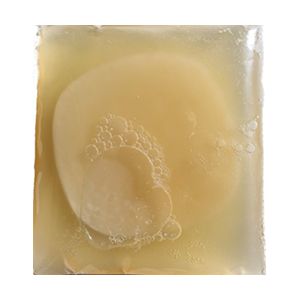 A scoby, however, is made up of both a mix of bacteria as well as strains of yeast. This is the culture starter which causes lacto-fermentation to occur by essentially feeding off the sugar and caffeine and changing the chemical composition of the original tea liquid. 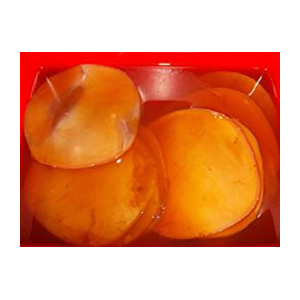 Although there are some possible differences from one scoby to the next, most all produce the phenolic compounds: gluconic acid, lactic acid, glucuronic acid and acetic acid. As mentioned, mature ferments are usually also a rich source of probiotics, enzymes, B vitamins and other various nutrients. Kombucha can actually contain small amounts of alcohol, so beware of that if you are trying to avoid consuming it, even in small quantities. The level of alcohol depends on a number of factors. Shorter ferments are known to contain more alcohol than mature ones. Also, if more sugar is added at the end and allowed to sit in an air locked jar to increase fizziness, this will also increase the alcohol percentage, which may average between 0.5-1% alcohol content. All commercial brands are now required to state alcohol content on the jar labeling if it is at or above 0.5%, the legal limit in the United States. If so it is actually categorized as an alcoholic beverage which requires an ID to be purchased. Some companies, like GT's, offer both non-alcohol (below the legal limit) and alcoholic versions to satisfy a range of consumer taste buds and preferences. "Due to natural fermentation this product may contain trace amounts of alcohol." "Contains less than 0.5% by volume." "Must be 21 years of age to buy this product as it may contain over 0.5% alcohol." It is important to keep in mind that most all fermented foods and drinks do inherently produce trace amounts of alcohol, which can even be present in sauerkraut. 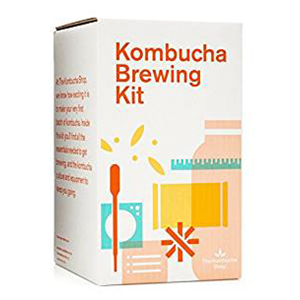 For those avoiding alcoholic beverages (even trace amounts), try our refreshing, fermented rejuvelac beverage, for an alternative to this mushroom tea. Because this fermented drink is full of live active enzymes it is an excellent digestive aid that can help break down the foods we eat and more efficiently convert them to energy. Many people today could use more enzymes in their diet especially those who consume high amounts of cooked foods, dairy and animal proteins. Our digestive functions naturally provide saliva and digestive enzymes, but over time eating foods low in enzymes reduces one’s own digestive enzyme reserves. 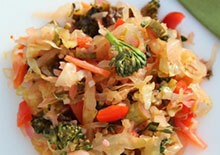 Consuming raw living foods as well as fermented foods, like raw cultured vegetables, kombucha and miso, can be a valuable asset to overall health and helpful for processing the leftover waste material that can result from an enzyme-less diet. Another great benefit to drinking a cold refreshing glass of "mushroom tea" is that you are taking in billions of tiny probiotic microbes beneficial to a balanced intestinal ecosystem. These microorganisms are produced as a by-product of the culturing process. 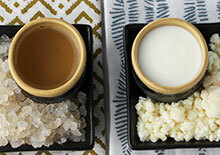 The mature tea can also include different forms of yeast such as S. boulardii and Z. kombuchaensis, Z. bailii as well as some species of Candida. 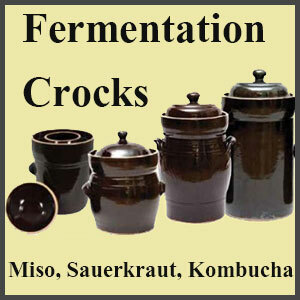 It is very important, when making your own homemade ferments to use a quality scoby culture as well as air-lock cap to prevent the overgrowth of some of these unwanted yeast strains. 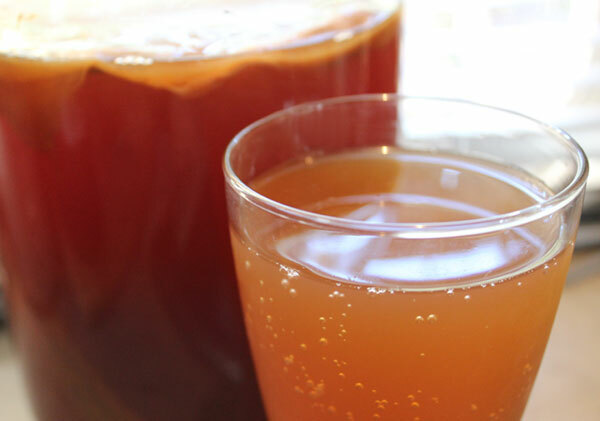 As a lacto-fermented drink, kombucha is naturally resistant to pathogenic species and airborne molds, inhibiting harmful microbes like E. coli, Sal. enteritidis, Sal. typhimurium, and Sh. Sonnei. The cultured mushroom tea is the perfect energy drink and a great alternative to highly caffeinated sodas, tea or coffee. It contains a number of nutritious elements including amino acids, polyphenols, vitamin C and is known to be high in B vitamins. B vitamins are natural energy boosters and the average kombucha drink contains close to 20% B2, B6, B1, B3, B12 and folic acid per serving. 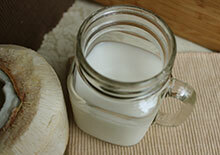 Adequate intake of B vitamins is known to reduce anxiety and depression as well as increase cognitive functions. 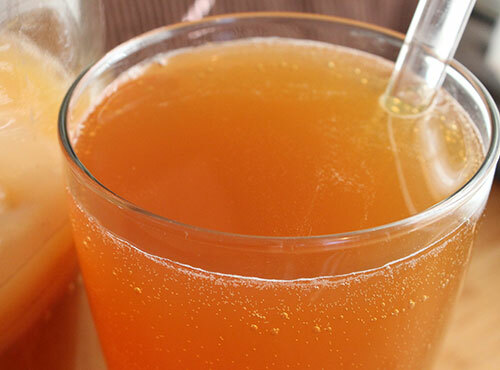 One of kombucha's claims to fame is that it helps to increase immune health. This is in part due to the enzymes, nutrients and friendly microbes present, but also because it is quite high in various antioxidants which naturally benefit the immune system. These antioxidants include EGCG (Epigallocatechin gallate) and vitamin C in addition to the organic antimicrobial acids: glucuronic acid, lactic acid and acetic acid. Moreover, drinking and eating food high in enzymes also helps to substantially increase immune response and counteract the immune lowering side effects of denatured prepackaged foods and chemical ingredients. The drink is a known detoxification aid for its effects on the digestive system, which helps to release the burden on the liver. This is primarily due to its glucuronic acid content, a compound that binds with toxins in the body and safely eliminates them through a process known as glucuronidation. 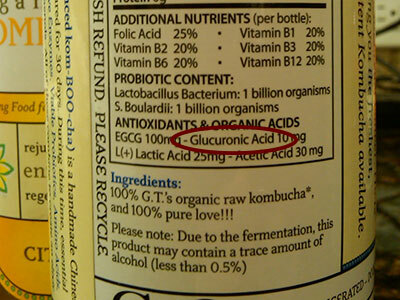 Along with glucuronic acid, acetic acid is another main component in kombucha drink responsible for its detoxification properties and is typically present in about three times the amount of glucuronic acid. Does It Contain Caffeine or Sugar? 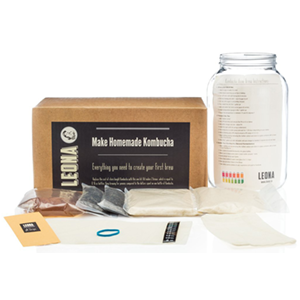 Many people who drink kombucha are often concerned that they are taking in the caffeine and sugar content that is used as a substrate for the scoby culture to activate the lacto-fermentation process. 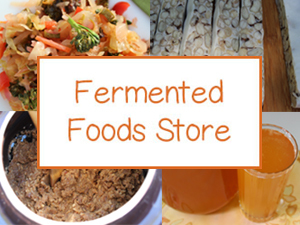 Visit our fermented food recipes page in the link below to get our top 7 recipes and more ideas on how to culture your own food and drink. 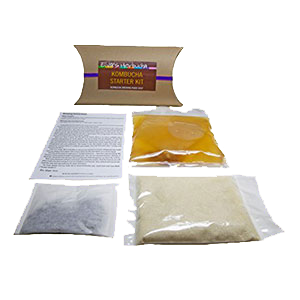 While a good percentage of the sugar and caffeine used to make the end result are consumed and transformed by the mushroom culture, it is now known that some caffeine content does remain. This level is roughly about half to one third the amount of the tea it was created with. The good news is for non-caffeine drinkers, when making your own homemade version, is that you can use other types of tea to reduce or eliminate caffeine present in the final ferment. The general rule is that after you make four batches of tea, using black tea and cane sugar, and develop a strong mature scoby culture, you can then experiment with herbal teas or other types of tea lower in caffeine content. However, it is commonly recommended to use at least 25% tea from the Camellia sinensis species when substituting these types in recipes. As far as the sugar content goes, the culture feeds off of the sugars and converts most of it into acids, like lactic acid, necessary for the fermentation process. 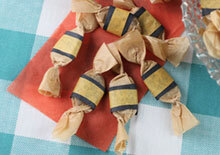 When appropriately "ripe", right before it turns to vinegar, it actually contains very little sugar. When home brewing your own, this phase is usually between 10-12 days or when it is slightly vinegar-like in taste, but not overly so. Most people prefer some sweetness and this can be achieved through shorter fermentation times or alternatively adding other low glycemic sugars, like coconut sugar, after this process. 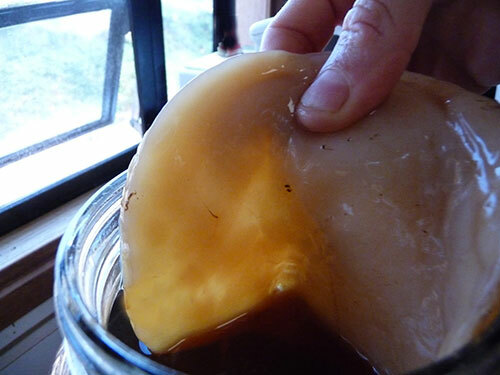 Again, once you have a strong thick mother scoby, created from using black tea and cane sugar, you can then begin to experiment with other types of natural sweeteners, like combinations of honey or maple syrup. 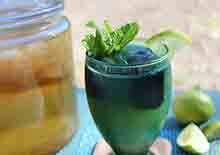 Making kombucha is similar to the process used to make other ferments like vinegar, jung and kvass. The tea is relatively easy to make once you get down a few basics. 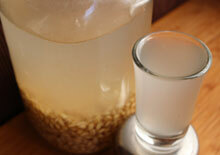 Mature kombucha derived from a raw commercial brand or previous homemade ferment. 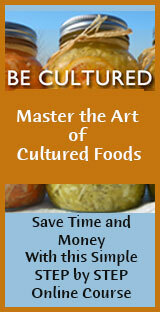 A scoby culture OR you can grow your own using an entire bottle of raw active liquid. You can find commercial brands (there are quite a few now) at most health food stores and many larger chain supermarkets. We always recommend buying high quality, raw organic kombucha as the next best option to making your own homemade versions.